You can trust the propane pros at Poore’s to get you set up with the right size propane tank, and then ensure prompt deliveries. Constructed to last for decades, our underground and aboveground propane storage tanks are made of heavy-gauge steel with a special coating to prevent corrosion. We have a range of sizes to suit your home’s needs—from smaller tanks to provide fuel for multiple appliances to larger tanks with the capacity to heat a large home as well as run appliances and even heat a pool or spa. Our propane tank experts will assess your needs and help you choose the tank size that’s right for you. We sell and lease these large fuel storage units for our customers at a competitive rate. On the day of the installation, our crew will arrive on-site with a backhoe and excavate a space to fit your underground tank. After we install the tank, we back-fill and level the space. Approximately 2–4 inches of the tank top, or dome, will be visible above ground level to facilitate deliveries. A: We always recommend leasing a tank from Poore’s because you will have much less to worry about. When you lease your tank from us, we are fully responsible for tank maintenance and safety; we are experts in the safe handling of propane tanks. Q: Do most people lease tanks from Poore’s? A: Yes. Most customers find this is cost-effective and lessens worries. Buying and installing your own tank could cost several thousand dollars, depending on its size and type (aboveground or underground). A customer who owns a tank is also entirely responsible for all maintenance and repairs. 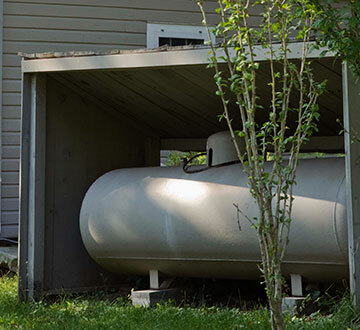 A: Before setting you up with a tank, our propane experts can help you evaluate your needs and ensure that you have the right size tank for your home. We determine the size of your tank by usage. If you use propane for various appliances but not for heating their home, you will require a smaller capacity tank than a home that uses propane for central heat. Large homes, as well as businesses, also require larger capacities because of their fuel usage. Need to learn more about your propane tank options? Contact us today or call our office. And check out our special tank offer for new propane customers.